Today this is our art gallery. Inside the chairs are already set up in a circle for us. There is hot coffee and Labrador tea. And there is bannock made special for tonight. We don’t turn away anyone from the path.¹ By now you should know that when we come to the art gallery, it is a time to share our best stories. You should also know that there is a lot at stake in the sharing of these stories. Reputations can be made in one night. Reputations can also be broken in one night. From one quick glance, I can see the gang’s all here. My favourite cast of characters. I know from one look around the room that it will be a really special night, and they will tell stories in turn until there is one recognizable winner. And at the end, he or she will go home with the title of cultural storytelling hero for one night only. In the circle I see that there are several of our Raven brothers here, waiting their turn to speak. Those Ravens have tricky stories. They are always telling of making loud trouble. I see several standing Aunties and Uncles have joined the circle tonight; their eyes tell stories of catching giant fish and walking up hill to go to day school, down for lunch, and then back up the hill for the rest of the day. And I see our cousin Frog has come back to join us. Her stories are always full of sadness. Enpaauk is here also. He is waiting his turn to speak. His story starts, as all the stories start when spoken here in this city and in this circle: I want to acknowledge the Indigenous Nations whose territory we live in, and acknowledge them for allowing us to live here on their traditional territory for the time that we have. I can’t help it. While I am sitting in the circle, I am the most interested in the graffiti story that Andrew tells. The story seems out of place, in this book of traditional stories that the others tell. I’m curious about it. I want to interrupt and ask questions. But I’ve been taught that I need to wait my turn to speak. The story he tells about his art making begins at the age of 13 with a spray can and an empty street at night. It moves from tags, to planning throw-ups, to designing pieces and murals, and continues towards creating a visual style that is part graffiti, part beadwork, and part Northwest Coast form line. This story is a visual taxonomy. His story of graffiti reminds me of an older story I heard about the maker of petroglyphs. Graffiti has the allure of the moon. It is the walking at night, in the twilight hours, alone, in mostly lonely locations. Just like the moving out on to the traditional territory, strong inspirations can happen when you travel back out into a moonlit cityscape. The petroglyphs are also about moving out into the landscape. They are also a moving with purpose. The making of a petroglyph is a very specific cultural marking into the history of the landscape. It is like a story within a story of the land – it tells of a location, a journey, a marking of time, and a marking of the history of the nation. The petroglyph story talks about a dreaming that needs to be done in preparation, a dreaming not unlike the dreaming of graffiti. Its making also requires planning as most petroglyphs are done in secret, in secret locations, in secret writing. Then Enpaauk’s story makes perfect sense. I see his artwork return to the city past the walls of the story and the gallery, the making of a new style of petroglyph into the foundations of art, and etched into the cement stones of the cityscape. The animals that figure prominently in the visual works grow and embody the topographical letters, adding extra layers of meaning beyond the indigenous, and beyond Western art history. This line is distinct and accessible; it stands apart from any of the other form line work I’ve seen. It doesn’t just define the two-dimensional space; it envelopes it because the perspective is unique to the histories that move with it. The line looks like it is breathing and pushing itself out of the frame on to the walls, and back out onto the street. The colour of the work is sharp and straight out of the can, no mixing. It is the same strong colour that bead workers use to tell their stories of our history. It is the same no-apology colour I’ve seen in the works of other prominent Aboriginal artists. Today we come to a new gallery. It is a gallery that lies directly at the point of intersection of identity, place, histories, locations, culture, and practice. This gallery is a place that welcomes our urban culture. In the story of beadwork, the work is done as a prayer. As you sit there, picking up beads on your needle, you are making prayers to the creator and sending good thoughts into the community. This beadwork is your way to contribute to community memory. In the story of the button blanket, the wearer dreams up the crest. The maker of the blanket, depending on the community, will put three hundred and sixty-five buttons along the border of the blanket to symbolize the days of the year, and each button year is stitched with good thoughts for the wearers on those days. This is what the art brings with it to the gallery. In the story of the Aboriginal graffiti artist and his paintings, he is bringing visual medicine⁷ to the people. And that is what he is contributing. Like the other artists of our community, he is bringing a line that is a path out to the land. And like the graffiti we see in the dark place of our city, this line is a good reminder to remember and look for beauty wherever we are. 4. 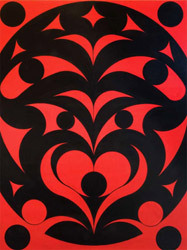 Huu Yaah is a Haida artist and is Andrew Dexel’s mentor. 5. 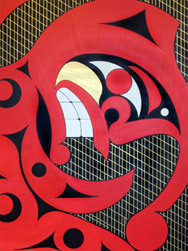 Joe David is a Nuu-chah-nulth artist.